Volatility Control is way of dynamically managing an equity portfolio to a constant level of risk, a more detailed introduction can be found here. In this post we walk through an example of how a volatility controlled approach to investing in the FTSE 100 behaved during a recent period of time, one that saw a significant amount of market volatility. • As we can see in the chart, prior to July 2011 the volatility of the FTSE 100 had been relatively low and stable at around 15% for a period of time before July 2011, resulting in a market exposure of around 70% for the vol controlled strategy. •The volatility increased quite sharply in late July and early August 2011 reaching a peak of around 35% at the end of September. •Hence the Vol Control strategy de-levered throughout this time to a low of around 30% exposure. •Given the initial falls were quite sudden and sharp, the Vol Control strategy participated in around 70% of the fall (it was around 70% exposed). •Subsequent to the initial falls, the FTSE 100 was extremely volatile in September 2011 in both directions, as can be seen in the chart. •The Vol Control strategy was substantially de-levered during this time, so experienced a much lower level of volatility of around 13%. •It took until late 2012 for the Vol Control approach to recover the level of exposure it had prior to the “crash”. •Over this period, the underlying FTSE rebounded quite strongly, as various macroeconomic themes and announcements took place, which led to a recovery in confidence. •By March 2012, the FTSE had recovered to above its level at the start of the volatile period. 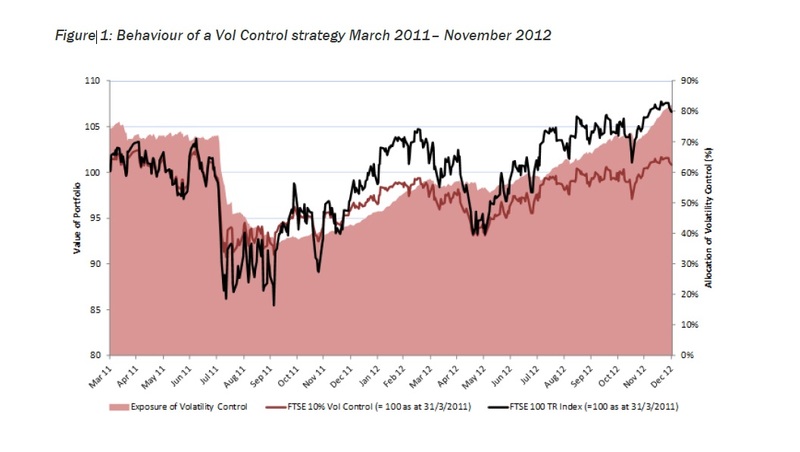 •However, given its lower allocation over this period of time the Vol Control strategy lagged the upward performance of the FTSE, and was slightly below its starting level by March 2012. Volatility Control has a role to play in the asset allocation of pension funds and other investors, compared with a fixed allocation approach. By allocating capital according to risk rather than fixed exposures, we can achieve better risk-adjusted returns over the long term. All market crash periods are different; in some crisis periods, a Vol Control approach will substantially outperform a fixed allocation through the de-gearing mechanism, whereas in other cases it may lag behind a fast market recovery for the same reason. In both cases it has achieved its objective of reducing the risk of the equity investor.